Church of the Big Sky: Matthew Lesko is following me!!! Okay, quite probably not, but, as it appears he lives in the same 'hood as me, I sure do see him an awful lot. I see him at my coffee shop, in parking garages, on the street. And he's always wearing one of Those Suits. Those hideous, hideous suits. 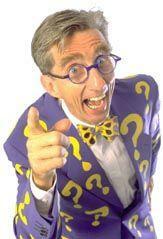 You don't know who Matthew Lesko is? Oh, sure you do. And, apparently, Matthew Lesko and I circle the same territory. He has a bright yellow Mini Cooper covered in black question marks. He has a scooter (green, I think - it was dark) covered in question marks, and he has The Suits. Each time I see him, Lesko is dressed in a different suit... covered in question marks. The first time I saw him at Mayorga Coffee up in Rockville, he was in a lime green suit festooned with purple question marks. He had matching lime green eyeglasses and lime green running shoes. He looked like the Riddler on acid. He was quietly tapping away on his laptop, and people entering the shop would surreptitiously look and quickly turn away, as if their retinas were burned by the sun. Two businessmen, seated on the leather couch across the way, kept stopping to look over. I heard one finally say, "Well, that's really freakish." Matthew Lesko - not exactly dressed to stalk anyone. But, you've got to admire his brand management. You see him once, you know exactly who the hell he is. I'm sure that, in the course of living in suburban Maryland, I've seen some of the same people many times over, but they're not recognizable as return visits to my brain, by virtue of their societally-accepted fashion sense. Lesko, on the other hand, stands out like a Marvel comics character in a grey scale world. Last week, on one of my free-wifi-Internet-job-hunt-grovel-grovel trips to Mayorga, I spotted Lesko again. This day's ensemble featured a grey suit with orange question marks, matching orange running shoes, and colorless plastic eyeglasses. I took a seat at the back of the cafe, with a direct sightline to the man in the grey freaky suit. I called the Sasquatch, and, in half-assed German, told him that, once again, I'd crossed paths with The Lesko. (Why German? Hell if I know. I guess I figured that, if you're going to speak about someone in a coffee shop on your cell phone, why not take a chance that he doesn't understand German. Stupid thing to do, frankly, in overeducated DC. I hear people trying to get away with being rude in Russian all the time. It amuses me to walk past them and offer a friendly greeting po russkiy and watch their faces fall. Bad Merujo. Bad, bad Merujo.) So, finally, I tell the Sasquatch that I'm going to go up and ask Lesko how many of those suits he has. Why the hell not? I stroll to the front of the cafe and order an iced coffee and, once procured, head over to get some Pink Death (aka Sweet 'n' Low), on the table next to the Riddler of Rockville. And, finally, I interact. I apologize for disturbing him, but I've seen him there a zillion times and I had to ask, "Just how many of those suits do you have???" Matthew Lesko, it turns out, is rather charming and polite. He stands up, shakes my hand, and laughs. Clearly this isn't the first time he'd been asked about the suits. He has "about 12" according to his count. I tell him that I've seen him so many times that I'm going to start a "Lesko Watch" on my blog. Again he laughs, thanks me, and wishes me well. The guy even made a point of dropping by my table to say goodbye before he left. A little odd, but, the guy's got a good sense of humor. Last night, leaving the parking garage down in the Yupster Central portion of Bethesda (Bethesda Avenue, where the affluent go to pretend they're European!) I ran into Lesko again. I was leaving the garage elevator, and he was getting on. This time, he was wearing a white suit with royal blue question marks and wild, multi-colored Harold Lloyd specs sat on his nose. "We meet again," I said, doing the best noir-ish voice one can channel in a parking garage elevator. Lesko laughed and patted me on the shoulder. "Good to see you again!" And, just like that, he was gone. Like a really tall, thin, strangely dressed gorilla in the mist. At least someone in downtown Bethesda isn't taking himself seriously - and it looks like he's making decent money doing it. And good for him, say I.
I can't believe Matthew Lesko wears those suits out in public when he's not shooting a commercial. Thanks for your kind words on my blog. I think you underestimate your own talent. I enjoy reading your blog. And thanks for your nice comments - I really appreciate it. BTW, I read your blog entries to folks over the phone. Wonderful stuff.